During the 1930s the Soviets decided to mechanize as much of their country as possible, and that meant replacing horses and mules with tractors. Having just purchased a number of foreign designs, the Stalingrad Tractor Factory (STZ) used some features from the Carden-Loyd tankette and the International TA-40 to create a light standard tractor dubbed the STZ-NATI-1TA. 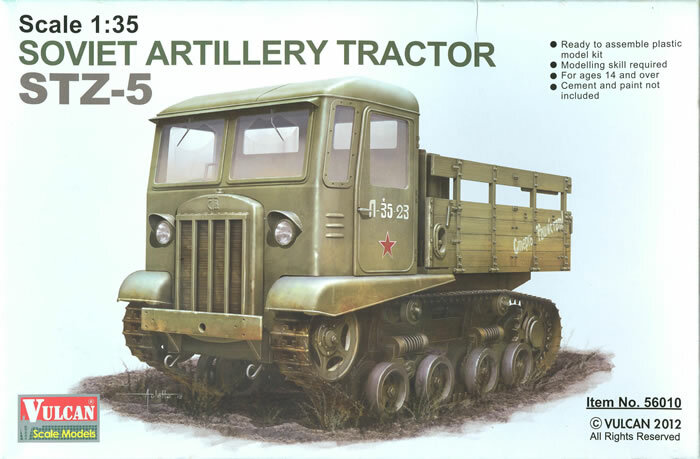 When militarized, the new tractor was dubbed the STZ-3. 16,000 of these were built of which one quarter went to the Red Army prior to June 1941. But the tractor had two drawbacks from a military standpoint: while powerful it was slow, and as a tractor design it only had seats for two personnel. As a result, in 1938 a redesigned variant, the STZ-5, was introduced for military service. While retaining a drawbaw pull of 8,000 kilograms (it could do 24,000 but that overstrained its frame) it had a top speed of 25 kph and was more suited to military needs. It also had a cargo body that permitted it to carry both a crew of 8-10 men and ammunition for whatever gun it was towing. It was capable of handling any 57mm or 76mm gun, 76mm or 85mm antiaircraft guns, and 122mm or 152mm (M-10 or D-1 type) howitzers. By the time that the Germans overran its factory in Stalingrad in August 1942, more than 9,900 had been built and many served throughout the war. Due to the changes in weapons size, most of them returned to agricultural service after the war ended in 1945. Vulcan recently released a 1/35 scale kit of the STZ-5 tractor, and while the term “cute” is rarely applied to a military vehicle this one comes close! While it is a nicely detailed kit, Vulcan did not go nuts on the breakdown of parts and as a result this is a reasonably detailed kit with a reasonable number of parts. Assembly is much like its real counterpart – simple and sturdy. The chassis consists of five main parts (engine platform, connector rails and side rails) and contains the lower half of the engine block. It has a nice representation of the sprung tow hook at the rear of the chassis (with a real spring!) The suspension has two springs for the idler adjustment at the rear of the chassis and a spring inside each of the bogie units. While the directions show the springs for the latter added after assembly, I think based on experience adding them with the VVSS “keepers” (parts F7) may make things a lot easier in the long run. The use of “link and length” tracks is a wise one as the track shoes are pretty tiny – about the size of a 1/72 scale main battle tank’s tracks. As the directions have you add the “wrap” or single links to the idler and drivers before installing the main sections, I suggest leaving the wheels “loose” to adjust fit of the tracks on at least the driver end. The top part of the engine cements directly to the cab floor and has the entire engine hood assembled around it. The top sections (parts D6-D7) are poseable but as the engine is in the middle of the cab this will be hard to see. Controls include the steering levers, shifter, and at least the clutch and brake pedals. While the doors are each two parts the windows are pretty much fixed items and cannot be adjusted for up/down as with some other kits. Assembly of the model’s body is a straightforward affair and provides the bench seats on either side. Finishing directions are provided for two vehicles: a Soviet Red Army one (4BO green, registration number L-35-23, slogan “Death to the Fascists!”) and a captured German one (either WH or WL use). A small sheet of decals is provided. Overall, there are a lot of nice artillery pieces out there now (from regimental 76mm guns through divisional weapons, 100mm BS-3 guns, and the 122mm M-30 howitzer among others) as well as extra limbers for ammo. All of this means the STZ-5 can be used as the heart of a nice display model of an artillery train or a diorama. Thanks to Peter Brown for the review sample.